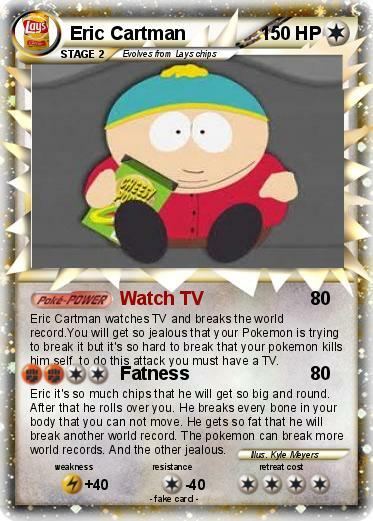 Eric Cartman watches TV and breaks the world record.You will get so jealous that your Pokemon is trying to break it but it's so hard to break that your pokemon kills him self. to do this attack you must have a TV. Eric it's so much chips that he will get so big and round. After that he rolls over you. He breaks every bone in your body that you can not move. He gets so fat that he will break another world record. The pokemon can break more world records. And the other jealous.